Whether you desire museum quality display pieces or battle ready jousting armour we feel confident you can find it here at By The Sword, Inc.
Quality 13th Century Kettle Hat is made from 18 gauge steel, functional and is available with a standard 23 ½" head circumference. This quality 14th Century Kettle Hat is made from 18 gauge steel, functional and is available with a standard 23 ½" head circumference. Black Great Helm with Brass Fleur de Lis a quality Functional Great Helm made from 19 gauge steel can be custom made to your requirements. This Basinet with Grill Visor is made from 18 gauge steel and is available with a standard 23 ½" head circumference. Optoinal 14 and 16 gauge steel available. Functional battle ready Bascinet With Klappvisier Helmet is made from 18g steel and is available with a standard 23 ½" head circumference. Custom optional available. Beautiful example of an early 14th century Basinet Helm. They were the precursor to the clap-visor and pigface basinets. These helms were worn alone or under a great helm for extra protection. 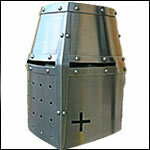 Our Crusader Flat Helm is made from 18 gauge steel with leather trim. Options available include custom sizing. This Battle Ready and Functional Early Crusader Great Helm is made from 18 gauge steel and is available with a standard 23 ½" head circumference. Early Great Helm Germany is made from 18 gauge steel and is available with a standard 23 ½" head circumference. Steel reinforcement. Classic Great Helm Steel is battle ready and fully functional. Made from 16 gauge steel and is available with a standard 23 ½" head circumference. Weight 7 Lbs. Steel reinforcements. Developed early in the 12th century, the Crusader Great Helm became the mainstay of the Medieval fighting man and lasted for about 300 years. The Crusader Flat Helmet was developed in the 11th century and was worn mainly during the crusades. Made from steel with choice of padded or leather liner. Offered with your choice of Standard or Custom measurements. This unusual Crusades era Spangenhelm, based on an early 13th century example, is provided with a ventilated face plate, providing full face protection. This attractive version of a Crusader Great Helm features cruciform decoration in brass. Construction is in 16 gauge steel with an adjustable leather liner and chinstrap. The Medieval Bascinet Helmet With Chain Mail, worn under a great helm, made for superior head protection but could also be worn alone for foot combat. Standard and Custom Sizing! This version of Great Helm has brass-reinforcing bands with Fleur-de-lis terminals (the Fleur-de-lis was a royal symbol and not confined to France, as many suppose). Early Great Helm from Germany with Brass is made from 18 gauge steel and is available with a standard 23 ½" head circumference. Brass reinforcing bar. Early Great Helm Pot Helmet is made from 18 gauge steel and is available with a standard 23 ½" head circumference. Weight 5 Lbs. This Medieval Great Helm is made from 18 gauge steel and is available with a standard 23 ½" head circumference. Weight 6.8 Lbs. This quality Functional Great Helm is made from 1.2mm steel and is available with a standard 23 ½" head circumference. Functional Great Helm Hinged with Face Plate is made from 16 gauge steel and is available with a standard 23 ½" head circumference. Great collector piece. This Early Great Helm from Normandy is made from 18 gauge steel, functional and is available with a standard 23 ½" head circumference. Functional Visored Great Helm is made from 16 gauge steel and is available with a standard 23 ½" head circumference. Includes padded liner. 13th century, this form of French Great Helm is depicted in the Maciejowsky Bible. Also worn in the Crusades this functional helm comes with heavy gauge brass reinforcing plates. Medieval Houndskull Bascinet. Fully functional re-enactment version of the classic North Italian (Milanese) Hounskull Basinet! Late 14th Century helm c 1390. Optional aventail. 2mm Thick Steel now Available! Developed early in the 12th century, the Great Helm became the mainstay of the Medieval fighting man and lasted for about 300 years. This Great Helm is forged from 16ga steel. The Topfhelm or pot helmet, a roughly cylindrical formed medieval helmet type arose in the early 13th cen. Also known as a barrel helmet or great helmet, our Topfhelm is fully functional and forged from 16ga steel. The Medieval Great Helm - 14th Century Helmet, is fully functional and comes with your choice of steel thicknesses and many other custom options. The bottom edges of the helmet are completely rolled for comfort and safety. Also known as a barrel heaume, the Maciejowski Helm was the forerunner of what later would become the 14th century Great Helm. This reproduction has a protective cross over the face. An attached, adjustable cloth liner and chin strap are included. Made from solid 18 gauge steel. The Open Faced Basinet is made from 18 gauge steel and is available with a standard 23 ½" head circumference. Weight 3.5 lbs. This quality Tournament Great Helm is made from 18 gauge steel and is available with a standard 23 ½" head circumference. Steel Horns and crown. The Visored Great Helm worn with large amounts of padding, provided superb protection. Worn over a smaller helmet, as was frequently done, the great helm was almost impossible to penetrate.